WWT has been involved in goose and swan monitoring since the 1940s. Below is a selection of reports and papers that present the results from some of the surveys and projects that we have been involved in. 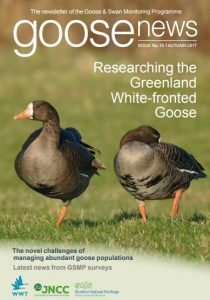 This in includes the results of many of the Goose & Swan Monitoring Programme (GSMP) surveys, which are available in reports and/or published as papers in journals; along with the annual newsletter of the GSMP, GooseNews, which provides various GSMP information. If you are interested in a particular report not listed here, please try our Publications page or contact us at WWT Slimbridge. 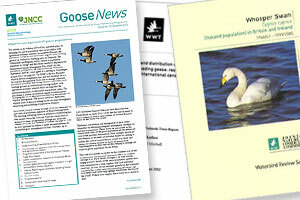 GooseNews is the annual newsletter of WWT’s Goose & Swan Monitoring Programme. It contains reports from monitoring activities, information on forthcoming surveys, and other information of relevance and interest to those involved with goose and swan monitoring in the UK. The International Swan Census aims to estimate population size and identify important wintering sites of Bewick’s and Whooper Swans. The first census was in 1986 and it is conducted every five years. Crowe, O., J.G. McElwaine, H. Boland & I.J. Enlander. Whooper Cygnus cygnus and Bewick’s C. columbianus bewickii Swans in Ireland: results of the International Swan Census, January 2015. 2015. Irish Birds 10: 151-158. Cranswick, P.A., K. Colhoun, Ó. Einarsson, J.G. McElwaine, A. Garðarsson, M.S. Pollitt & E.C. Rees. 2002. The Status and Distribution of the Icelandic Whooper Swan population: Results of the International Whooper Swan Census 2000. In: Rees, E.C., S.L. Earnst & J.C. Coulson (eds.). Proceedings of the Fourth International Swan Symposium, 2001. Waterbirds 25 (Special Publication 1): 37-48. Colhoun, K., J.G. McElwaine, P.A. Cranswick, I. Enlander & O.J. Merne. 2000. Numbers and distribution of Whooper Cygnus cygnus and Bewick’s C. columbianus bewickii Swans in Ireland: results of the International Swan Census, January 2000. Irish Birds 6: 485-494. The Icelandic-breeding Goose Census (IGC) started in the UK in 1960 and now includes over 120 sites internationally. It aims to estimate population sizes of Icelandic-breeding geese – Greenland/Iceland Pink-footed Goose and Iceland Greylag Goose – and identify important wintering areas. Spring counts of Pink-footed and Iceland Greylag Geese in Britain were carried out from 1982 to 1986, from 1988 to 1990 and from 1994 to 1996. The aim of these surveys was to determine the location of key sites used by the geese during late winter and spring, outwith the traditional autumn and early winter (IGC) counts. A spring count was re-introduced during the 2011/12 season and will be repeated on a three-yearly cycle. Results from these counts are available in the Icelandic-breeding Goose Census reports (see above). The Greenland White-fronted Goose Census started in the winter of 1982/83 and aims to assess population size and reproductive success, and identify important wintering sites for Greenland White-fronted Geese in the UK and Ireland. Reports can also be downloaded from GWGS resources, including reports for censuses prior to 2000/01. A number of different surveys of British Greylag Geese have been conducted throughout Scotland to assess the abundance, distribution and breeding success of this population. There have been two Scotland-wide surveys in 1997 and 2008-09, as well as a number of more localised surveys of key areas such as Orkney. Archipelago-wide surveys in Orkney have been conducted each August since 2012. The 2012 survey included a random stratified survey on Mainland, and made recommendations for future monitoring of Greylag Geese in Orkney. A number of other key areas, including the Uists, are also surveyed annually and these results can be found here. Find out more about the Scottish Greylag Goose Survey. Mitchell, C., L. Griffin, M. Trinder & J. Newth. 2010. The population size of breeding Greylag Geese Anser anser in Scotland in 2008/09. Scottish Natural Heritage Commissioned Report No. 371. Using ground and aerial counts, the International Census of Greenland Barnacle Geese aims to assess the population size and distribution, and important wintering sites of Greenland Barnacle Geese in the UK and Ireland. It began in 1959 and is carried out approximately every five years. Merne, O.J. & A. Walsh. 2003. Barnacle Geese Branta leucopsis in Ireland, spring 2003. Irish Birds 7: 173-176. Cranswick, P.A., C.R. Mitchell, O.J. Merne, M. Kershaw, S.N. Delany, M. Mackay & R. Lilley. Status and distribution of the Greenland population of Barnacle Goose in Britain and Ireland, 1993 to 1999. Unpublished Report. The Wildfowl and Wetlands Trust, Slimbridge. Merne, O.J. & A. Walsh. 2002. Barnacle Geese in Ireland, spring 1999. Irish Birds 7: 53-56. Delany, S. & M.A. Ogilvie. 1994. Greenland Barnacle Geese in Scotland, March 1994. WWT report to JNCC. The Wildfowl & Wetlands Trust, Slimbridge. Merne, O.J. & A. Walsh. 1994. Barnacle Geese in Ireland, spring 1993 and 1994. Irish Birds 5: 151-156. Walsh, A. & O.J. Merne. 1988. Barnacle Geese Branta leucopsis in Ireland, spring 1988. Irish Birds 3: 539-550. Dark-bellied Brent Geese have been monitored annually in the UK through the Wetland Bird Survey (WeBS) since the 1940s. During the 1970s and 80s, the population grew rapidly and associated with that growth was the increasing use of inland habitats by the geese for foraging. As a result, supplementary censuses of the population were undertaken between 1985/86 and 1994/95 that included extra effort to cover those sites not already monitored by WeBS. Age assessments made at wintering and stop-over sites are used to determine the annual reproductive success of goose populations. Dark Bellied Brent Goose age assessments have been carried out at many UK wintering sites every year since 1985. The age assessment report was discontinued after the 2007 breeding season. Detailed results for 2008 onwards are posted on the latest results page for Dark-bellied Brent Goose and summarised in GooseNews. WWT have undertaken several projects looking at the feeding distribution of geese in the UK. This information is becoming increasingly important for advising on changes in land use, such as wind farm developments, for looking at potential conflicts between geese and people, and for safeguarding important habitats for geese. Find out more about our work on goose feeding distributions. Brooks, P. & C. Mitchell. 1996. Winter bird surveys on proposed Special Protection Areas in Scotland, 1995-96: Greenland White-fronted Geese in Kintyre. Report to Scottish Natural Heritage. Wildfowl & Wetlands Trust, Slimbridge. The Waterbird Review Series brings together up to four decades of data and knowledge from the long-term monitoring programmes of swan and migratory goose populations that winter in Britain and Ireland. In each review, introductory sections describe abundance, distribution and ecology, particularly in Britain and Ireland but also through the population’s range. Gaps in our knowledge are identified and the conservation threats facing the population are described. Central to each review is a detailed inventory of important sites, where numbers and trends are presented along with a summary of site protection status, habitats and site usage by the population. This includes all internationally and nationally important sites in the late 1990s, but also sites of former importance where numbers have declined. Note: Although not part of this series, a review of the Greenland White-fronted Goose in Ireland and Britain 1982/83-1993/94 (Fox et al. 1994) has previously been published and is available from the Greenland White-fronted Goose Study web site (greenlandwhitefront.org).